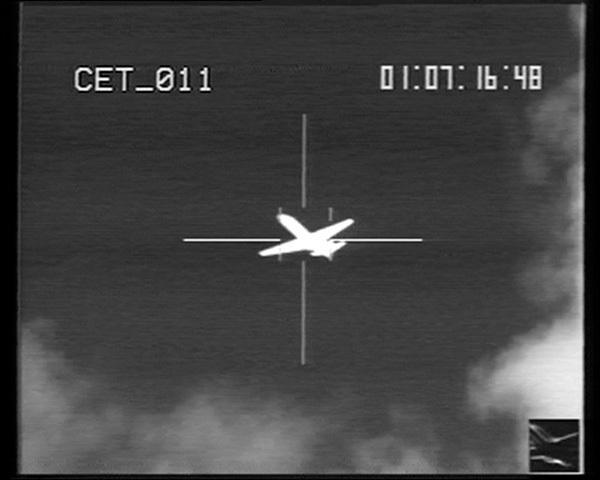 still from "Erkennen und Verfolgen", Harun Farocki, 2003, 58 min. July 30, 2017, is the third anniversary of Harun Farocki’s passing. To keep his work as a filmmaker and artist, and as an author and teacher, alive and also to make it available (anew) as a resource to a younger generation, Sabeth Buchmann and Constanze Ruhm, in cooperation with Jens Kastner, have devised a comprehensive series of lectures and events. As teachers, whose approach is close to Farocki’s own thinking and practice, Buchmann, Ruhm, and Kastner wish to readdress his work in film and as an author by focusing on his teaching activities. This relates to his highly influential role as a professor for film and art from 2004 to 2011 at the Academy of Fine Arts Vienna. Farocki’s students profited greatly from his film analysis, with its accomplished use of film and media theory and political reflection; as did the interested general public that came to his screenings of his own films and of the films of others. In this sense, this program of events entitled Recognize and Pursue (relating to Farocki’s Erkennen und Verfolgen from 2003), which will take place within the auspices of a lecture series of the same name at the Academy of Fine Arts Vienna, as well as evenings at the mumok cinema, will focus on Farocki’s profound interest in the relationships between image and politics and between practice and theory. It was not least Farocki’s own approach to teaching that made him a key influence on a young generation of artists and authors in particular in the field of documentary film. Conceived by Sabeth Buchmann and Constanze Ruhm, in cooperation with Jens Kastner and the Academy of Fine Arts Vienna. Tuesday 14.03.17 - 18.00 - M13 Ringvorlesung: Children’s Films / Children Filming. Antje Ehmann (Berlin) Sabeth Buchmann and Constanze Ruhm speak about Harun Farocki’s Sesame Street films. Tuesday 21.03.17 - 18.00 - M13 Ringvorlesung: Die Schilderung von Arbeitsverhältnissen. ERZÄHLEN (1975). Presented by Volker Pantenburg. Tuesday 09.05.17 – 18:00 - M13 Ringvorlesung: The Art of Teaching the Visible. Tuesday 16.05.17 18:00 - M13 Ringvorlesung: Thinking about Harun. Wednesday 31.05.17 – 19:00 - mumok cinema: Recognize and Pursue. Harun Farocki Series (2) - The Liminal as Event – Play and Narrative in Harun Farocki. Tuesday, 13.06.17 - 18.00 - M13 Ringvorlesung: Harun Farocki Writing: Journalism, Critique and Film Politics. Presented by Diedrich Diederichsen. Tuesday 20.06.17 - 18.00 M13 - Ringvorlesung: Heurism of Images: Learning through Cinematic Devices. Presented by Sezgin Boynik. Wednesday 21.06.17 - 19.00 - mumok cinema: Recognize and Pursue. Harun Farocki Series (4) Heurism of Images: Learning through Cinematic Devices. Presented by Sezgin Boynik.